Everyone needs a good, easy tomato soup recipe in their life. A simple, back pocket recipe to pull out for sick days, rainy days, and random Tuesday afternoons when you need something fast, healthy and straight up cozy. And just incase you don’t own yet an instant pot are aren’t interest in pulling out any large cooking equipment no worries. 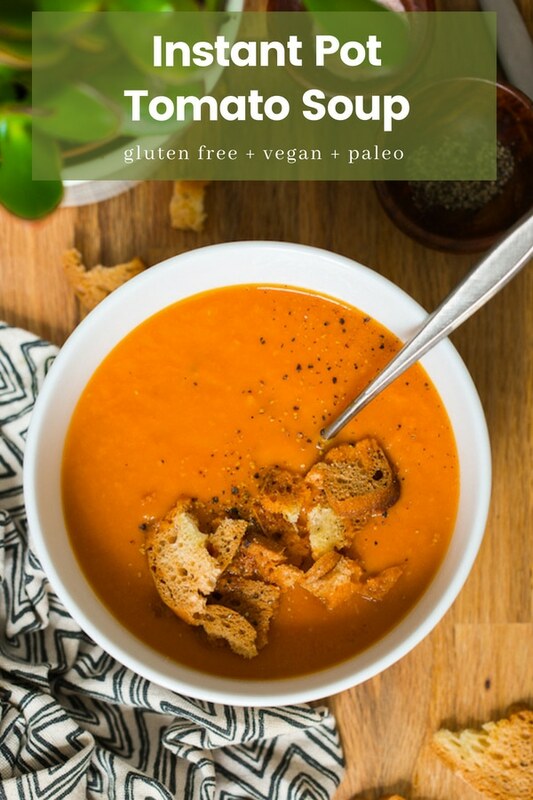 I’ve got a similar stove top roasted tomato soup that takes a little more time, sure, but it’s still dead easy and super delicious! That being said – if you’re looking for big flavour with minimal effort (and you don’t want to stand over a hot stove in later summer when these veggies are at their best) than carry on down, my friends! There’s a piping hot bowl of soup with some crusty bread with your name all over it. All together this soup takes about 30 minutes to make – most of that time is pretty hands off. You don’t need to worry about baby sitting a hot, bubbly soup over the stove top or checking the oven for burnt veggies. Adds another layer of flavour. Begins warming up the instant pot so that it will take less time for it to come up to temperature later to cook. 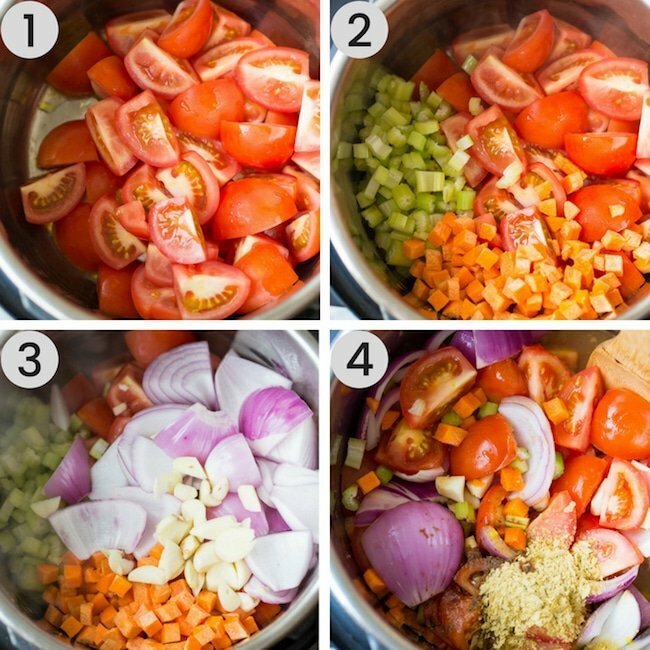 All you need to do is add your olive oil and start layering in the veggies as pictured above (pictures 1, 2 and 3). In fact, you don’t even need to chop the celery and carrots quite as much as I have in picture 2. I just enjoy chopping veggies and it looks neater in pictures. I’ve made this many times before by just roughly chopping everything into large, messy chunks without any problems. It will definitely blend up faster if you chop it all smaller, but by the time the soup is done cooking in the instant pot it will all be so soft and easy to process anyway. vegetable stock – what’s a soup without stock? And then just seal, cook and wait. When it’s all done cooking allow your instant pot to depressurise for another 10 minutes. With most instant pots you won’t even need to do anything extra here so go ahead and carry on with whatever you’re doing. 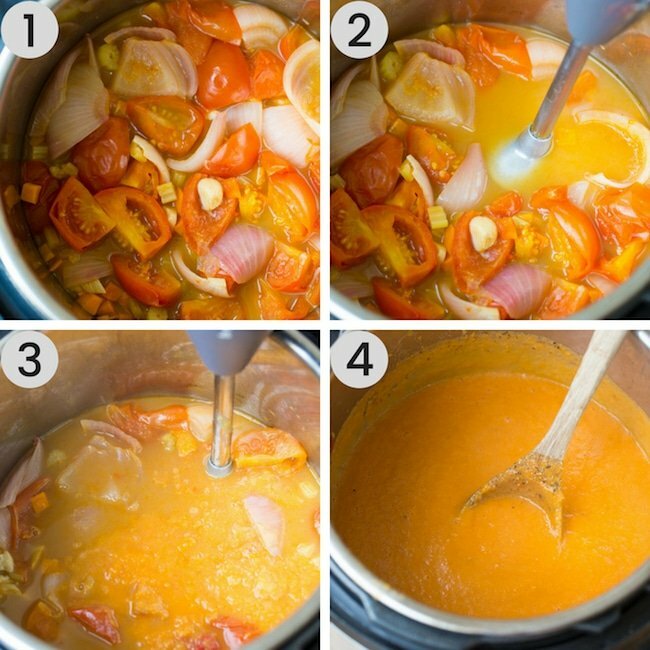 When you’re ready to go you can start blending up the soup into a smooth puree as seen in the pics above. Use an immersion blender right in the bowl or blend this up in a blender. If you use a blender I recommend blending this in batches – you don’t want to fill up the blender more than a third of the way full or you’ll risk hot soup splattering all around your kitchen. You can swap out the fresh tomatoes for two 14 ounce (or 1 28 ounce) can of fire roasted tomatoes. Standard can size in the UK (and I believe Europe in general) is about 400 grams so just use two of those. While I do believe that nutritional yeast is totally worth keeping stocked in your pantry you can use parmesan (vegan or dairy) in its place for a similar, cheesy flavour. Chicken stock can be subbed out for vegetable stock so long as you don’t need this to be vegan/vegetarian. To serve you can top this off with some homemade croutons or enjoy it with a slice (or three) of some crusty French Bread. If the season is right it would seem almost criminal not to add some fresh basil into the mix as well. 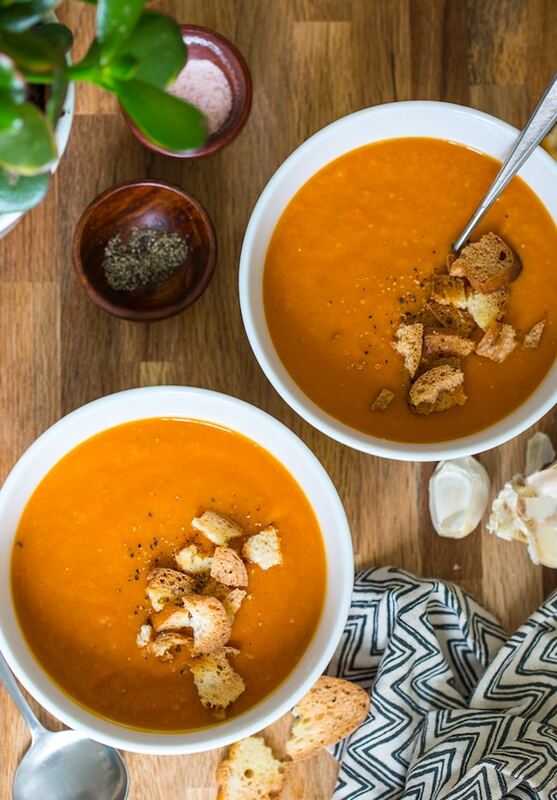 So long as this soup is involved – you can’t go wrong! 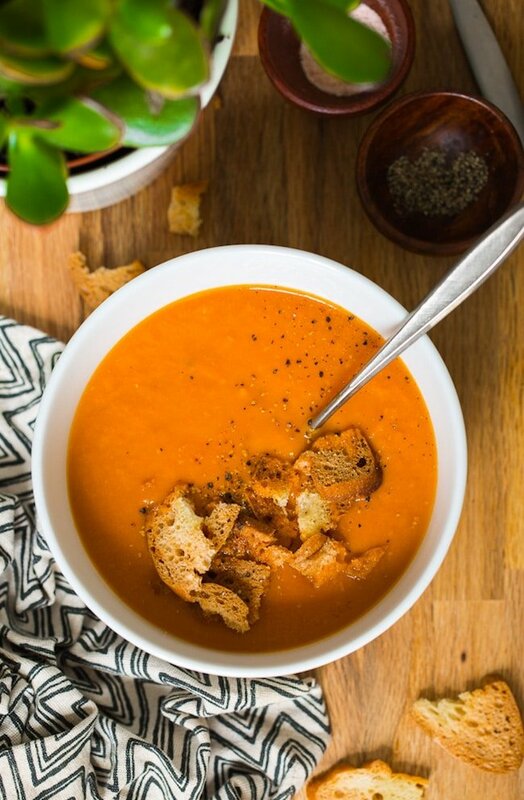 Don’t forget to #asaucykitchen on instagram if you try this Easy Tomato Soup! I love seeing what you make! You can also post your pictures to my facebook page! Press the sauté button on the instant pot (affiliate link) and wait for it to heat up. Add the olive oil. Add the tomatoes, carrots, celery, onion and garlic to the instant pot and stir. Cook 3 minutes, stirring often. Add the remaining ingredients (tomato paste, nutritional yeast, balsamic vinegar and stock). After the time is up the Instant Pot will automatically switch the keep warm. Let it keep warm for 10 depressurising on it's own before releasing the steam valve. Use an immersion blender to process until smooth. Season with salt and pepper to taste. If you don't own an immersion blender you can can blend up the soup in batches using a blender or food processor. Just make sure to be careful when removing the blender lid and open away from your body. You can use two 14 ounce (or two standard 400 grams) cans of fire roasted tomatoes for the fresh tomatoes if you like. You can use chicken stock instead of vegetable stock if you don't need this to be vegan/vegetarian. Yes! Since there is no dairy in this recipe you won't need to worry about it curdling/separating when reheated. Let the soup come to room temperature and store it in 2 gallon, freezer safe zip lock bag. Keeps well in the freezer for 6 months. Super good! I used frozen tomatos from last years garden and added basil. I will share with friends! Ooh I love that! Thanks Mary – glad you liked it! This soup is so delicious, seriously. Perfect texture, nice and creamy, and all I added was salt. 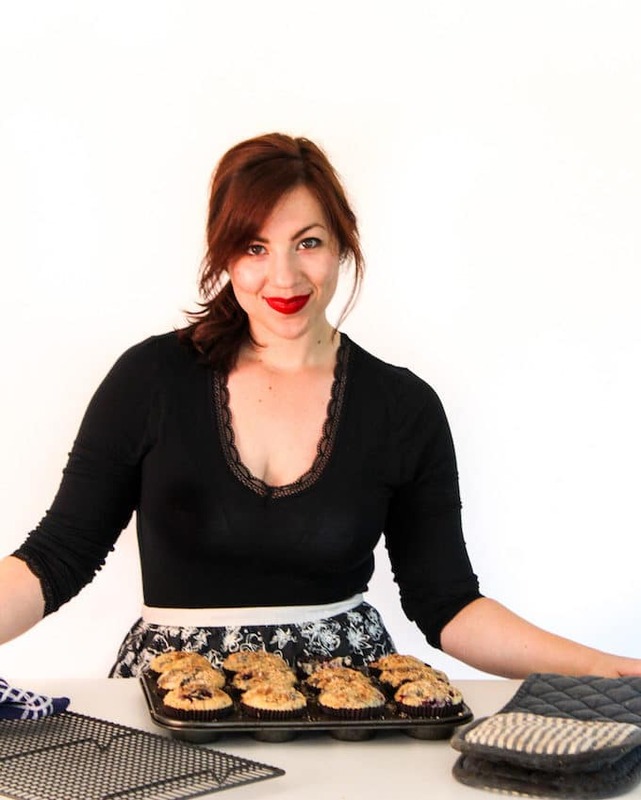 And what makes it even more amazing is that it really is as easy as throwing it all in the instant pot and letting it do its thing. It has officially hit the regular rotation list!! Thanks Katie! So glad you liked it! Thanks so much for coming back to let me know what you thought! If i don’t have an instant pot, would it work to bake all the veggies on a sheet pan instead and then emulsify them? It might add some good flavor too? This looks so healthy and good! I had always wondered how the soup got thick when using using whole raw tomatoes!